PAUL BISHOP ~ WRITER: HARDBOILED CORNER: DIAMONDBACK! 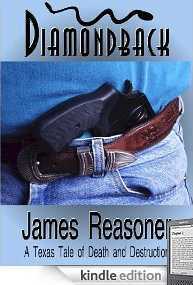 ALONG WITH A NEW COVER, BLOG BUDDY AND PROLIFIC AUTHOR JAMES REASONER HAS LOWERED THE PRICE ON HIS E-BOOK, DIAMONDBACK, TO 99 CENTS . . . PER JAMES . . .
What's it about, you ask? Well . . . A disgraced cop who's quick to kill. A truckload of bodies (literally). An army of violent radicals. A beautiful woman who can't be trusted. And, oh, yeah . . . snakes . . .
NOW, WHO WOULDN'T WANT TO READ THAT? I HAVE ALREADY, AND EVEN AT THE ORIGINAL PRICE, IT'S A TERIFFIC READ . . . GREAT STUFF, BUT I ALWAYS EXPECT GREAT STUFF IN A REASONER NOVEL . . . IN ADDITION, YOU GET AN INTRODUCTION BY BILL CRIDER AND AN AFTERWORD BY JAMES ABOUT HOW THE BOOK CAME TO BE WRITTEN AND WHY IT HASN'T BEEN AVAILABLE UNTIL NOW . . .